In an attempt to get the American public to eat something other than burritos stuffed with ice cream sandwiches (mmm... burritos stuffed with ice cream sandwiches...), Michelle Obama helped promote a recipe contest for healthy kid's meals. 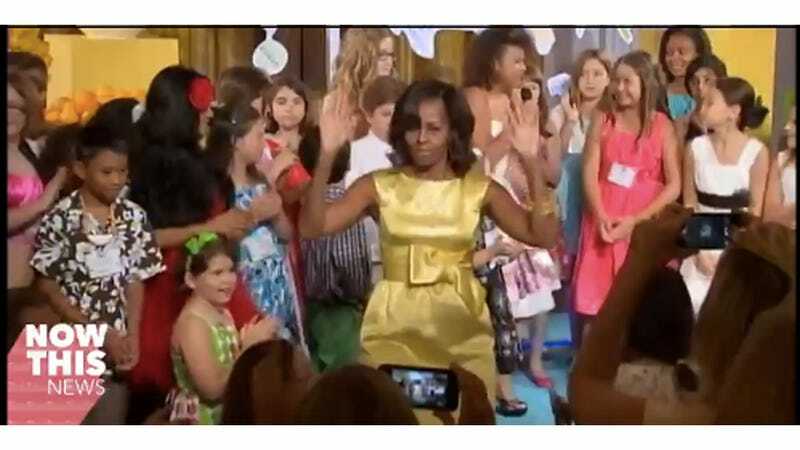 The winners were hosted at the Kids' State Dinner (adorable) tonight, and the FLOTUS celebrated by doing a dance. Oh, and if all this talk of ice cream sandwich burritos made you hungry, Epicurious has a cookbooklet with all the winning recipes in it. Just a heads up to Noah Koch, age 9, of Maine: I'm coming for your Vegan Powerhouse Pesto Pasta.